I've been avoiding mass consumption of caffeine lately- which means I haven't been brewing up my morning cinnamon hazelnut coffee, but I still want something warm first thing. Of course it's all so much more fun if you have a good mug. I found this little one in the back of my cabinet when I was packing up the kitchen for the renovation. 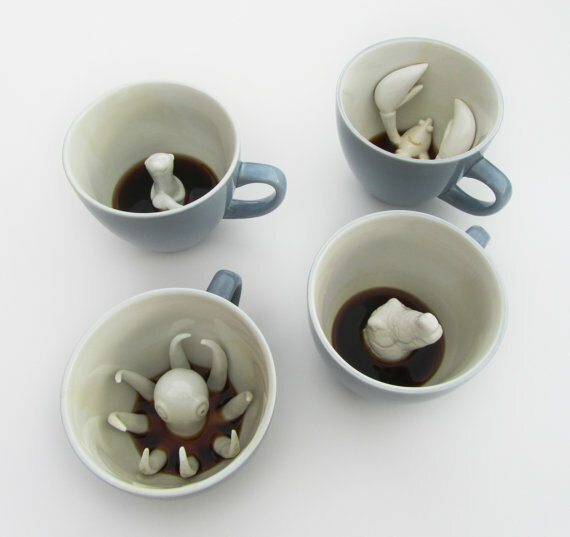 And then this morning I found these fun mugs by Yumi Yumi on Colossal. What a fun little gift for a friend or stocking stuffer for those who have everything. These mugs are only $19.99 or you can get a set of 4 for $69.99, find them on Yumi Yumi's Etsy site, Creature Cups!